Notre Dame professor Gabriel Said Reynolds interacts with students around the world during a live online session as part of his Introduction to the Quran online course. Gabriel Said Reynolds greets his students on the final day of his Introduction to the Quran course. He is in a small classroom on Notre Dame’s campus. His students are in Orlando, Colorado, Canada, Denmark, the United Kingdom, Saudi Arabia, and beyond. Such arrangements are not uncommon in the world of massive open online courses (MOOCs), but this one is different. It breaks new ground in the online learning space by bringing students participating in the MOOC around the world together with undergraduate and graduate students that Reynolds teaches in a traditional course at Notre Dame. 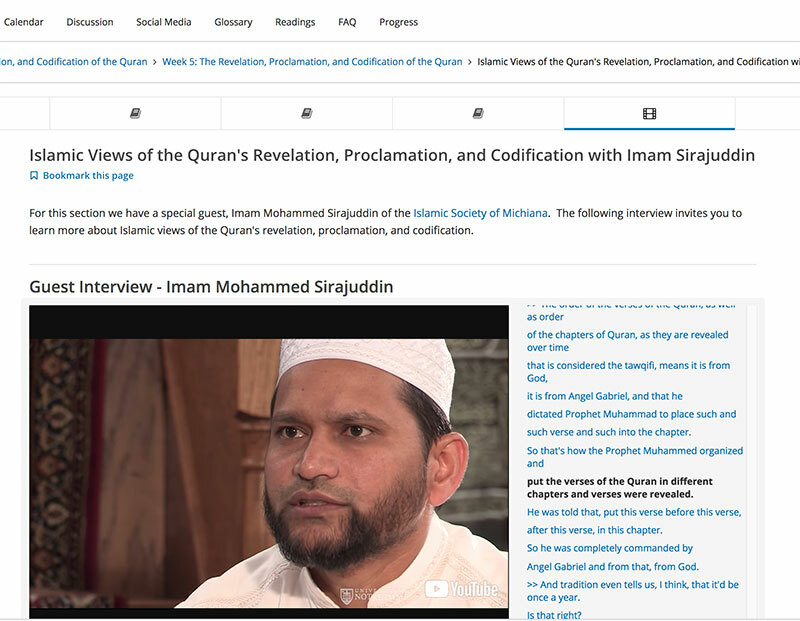 Partnering with Notre Dame’s Office of Digital Learning and hosted on the popular MOOC website EdX, Reynolds’ nine-week course covered the structure, themes, and context of the Quran, as well as how it relates to the Hebrew Bible and the New Testament. Simultaneously teaching 10,000 MOOC students and two dozen Notre Dame students offered tremendous opportunity to further push the boundaries of learning, Reynolds said. 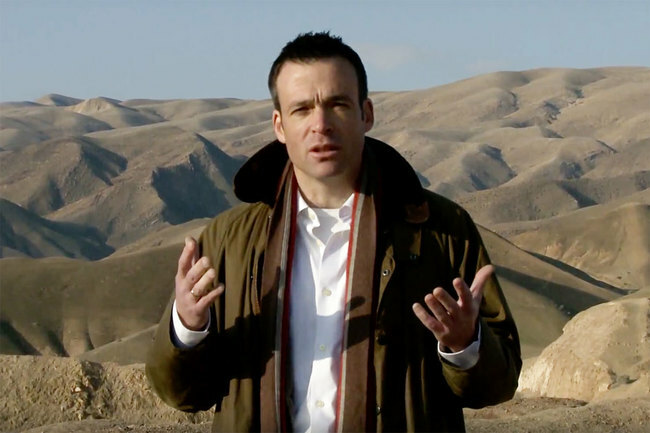 Reynolds’ course for Notre Dame and MOOC students included recorded lectures he gave at the Dead Sea, as well as in Jerusalem and on campus. Designed to engage a broad audience while offering a scholarly introduction to the Quran, the course features several Reynolds lectures recorded at Notre Dame, as well as lectures he gave at the Dead Sea and in Jerusalem. Students watch the lectures, follow along with the readings posted online, and participate in discussion forums, which allow students to interact with one another as well as with Reynolds and his teaching assistant. All of this is standard for a MOOC, but Reynolds was interested in offering something different. 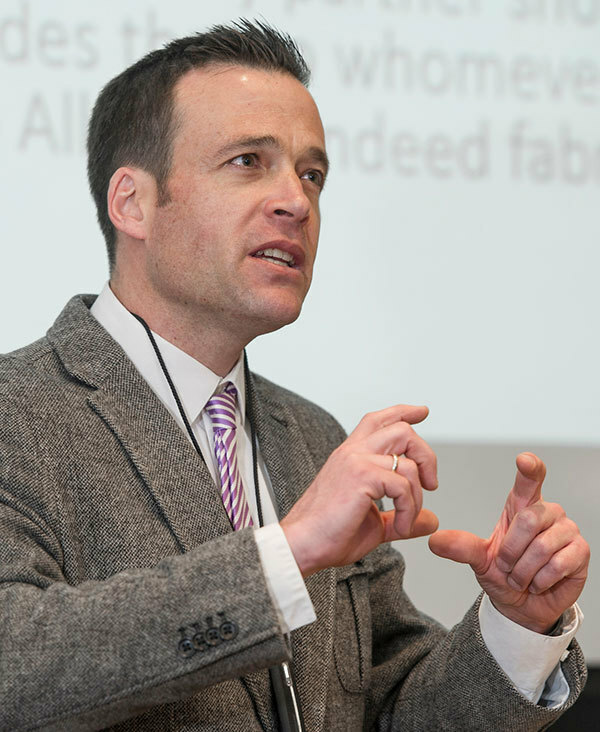 After leading a MOOC in 2015 that consisted only of recorded lectures and online discussion, Reynolds decided this time to add four additional live sessions, which included him interviewing guest experts. 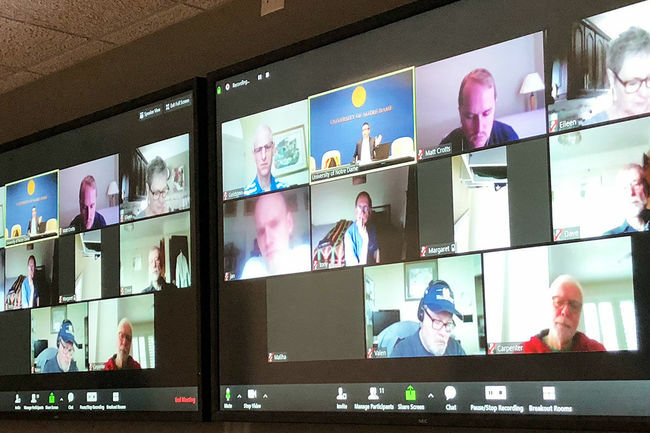 The live sessions also allowed Reynolds and his MOOC and Notre Dame students to converse with one another — a rare opportunity to hear from voices around the globe. The Muslim world was well represented with 100 students from India, 75 from Pakistan, and 50 from Indonesia, blending with alternative perspectives from students in Europe, China, and South Africa as well as the predominantly Christian backgrounds of the Notre Dame students. 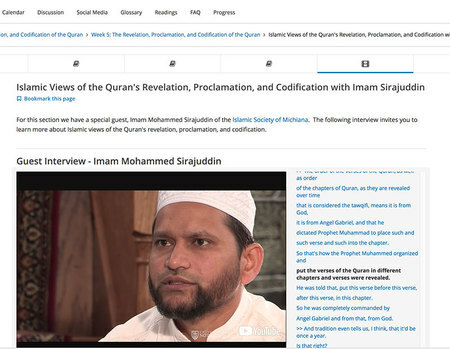 A page on the MOOC course site for a class session that included a guest interview. David Goldstein, a retired computer systems analyst in Florida and MOOC student, greatly appreciated that result. Notre Dame alumnus Edward Valenzuela ’78 enjoyed the chance to engage academically with his alma mater from his home atop a mountain in Colorado. Notre Dame students responded in similarly positive ways to their interactions with those around the world. Undergraduate Steven Burke not only took the Notre Dame course, but enrolled in the MOOC in order to engage in the discussion there as well. “The live sessions really helped me get the pulse of how other people were approaching these topics, with different perspectives than a student might,” he said. Reynolds found that the experience was particularly helpful for his Notre Dame students, as the direct contact with perspectives from around the world helped them think beyond their traditional classroom experience. While Reynolds is committed to the traditional classroom experience, he sees technology as an extremely beneficial pedagogical tool that can serve his students’ learning. Originally published by Katie Boruff at al.nd.edu on June 05, 2018.